One of the key brands for US players over the past several years has been Bovada, and their mobile casino product is a great option. They are licensed by the Kahnawake Gaming Commission, a jurisdiction that is held in high esteem. They’ve also been running since 2011, and they are owned and operated by the Morris Mohawk Gaming Group, a native Canadian tribe that has a good reputation for high-quality service. Overall, they have a great history of solid support and for paying out quickly and reliably to their players. If you’re looking for a mobile casino app that will give you a lot of promotional value, this is a good brand to choose. You’ll start off by getting up to $3,000 thanks to their welcome package for casino players. This comes thanks to two codes you can use up to four times each. The first is SLOTS500, and it’s worth 100 percent up to $500 as many as four times. The second is GAMES250, and it’s a 100 percent match worth up to $250 each deposit, and it can also be used four times. There is a 25x wagering requirement on the slots code with a 40x requirement on the other games code. You can play anything but single-deck blackjack, double-deck blackjack, sic bo, craps, roulette or Baccarat for the all games code, though play on some games may count at a higher play-through rate. On top of that, when you wager $250 in a calendar week in the mobile casino for the first time, they’ll add another $10 bonus as well just as an extra mobile-specific incentive. In order to promote their preferred deposit method, Bovada will award a special casino welcome bonus to players who make their first deposit using Bitcoin. The bonus offers players a 150% match bonus up to $1500, and this bonus is redeemable up to three times for a total of $4500. Should you decide to engage in their mobile sportsbook as well, you will get an additional 50% match bonus up to $500 to bet on sports when you deposit using Bitcoin. There are other regular promotions at Bovada for casino players as well, and most of them center around simple bonuses and chips that players can earn for real money play in games that they would be playing anyway. These promotions can be earned just as quickly via mobile, which makes them perfect for players who want to earn while they’re on the go. There are games available from two major software companies that allow US players at this mobile casino. Realtime Gaming, Rival Gaming and BetSoft all have titles available here. While you do not get the full selection from any of these three companies, since they have some titles (especially older ones) that have never been converted over to mobile, the fact of the matter is that they have optimized the ones that are available for mobile in a way that works out really well. The games are organized in a very smooth and intuitive lobby area as well, and that makes it really easy to find what you’re looking for in the mobile app. The Bovada Mobile Casino interface is completely web-based, and that puts you in a position where the vast majority of smartphones and tablets will be able to access it and play without any trouble. This includes devices that operate using iOS, Android, Windows Mobile, Blackberry and other operating systems, and it also includes lesser known devices with generic operating systems as long as there is a compatible Internet browser that supports Flash available. When you log into this interface, it will scale appropriately to the size of the screen on your device to make it easy to navigate. The controls are large enough to make sure you don’t tap anything you don’t mean to, but on devices with larger screens (tablets in particular), they also scale down to the point that they aren’t taking up a ridiculous portion of the screen. The games themselves are played with the touchscreen interface, and the controls for the mobile versions of these games have been designed in such a way that you don’t have to worry about hitting the wrong selection. Changing bet sizes and other options is also easy and intuitive on this app. There are several dozen titles available overall in multiple genres. The bulk of the selection is based around their selection of slots, and in this category, RTG and Rival Gaming generally bring different things to the table. BetSoft is also a contributor to the Bovada casino, and presents high quality game options as well. While they both have video slots available, Rival’s i-Slots selection gives players a chance to experience a storyline as it unfolds through their play. You’ll see different levels with different symbols, graphics and features, which kicks the replay value up tremendously. Realtime Gaming, on the other hand, brings a lot of progressives, especially those from the Real Series, their most popular series of slots available on mobile. On the other hand, you’ll also have plenty of non-slot titles, and this includes classic table games. Most classic table games are available, including roulette, Baccarat and multiple styles of blackjack. There are a number of different video poker styles also available, which is perfect for the mobile interface because it’s like you have a touch screen video poker terminal right in the palms of your hands. There are two ways to contact support, and they’re both very much accessible from the mobile interface. The first is a simple phone call to their customer service line, which is available 24/7 every single day of the year, even on holidays. In addition to that, there’s a simple email form you can fill out that will get you a response fairly quickly. In our testing, we received a response back within three hours. On the cashier front, you can manage all aspects of your experience straight from your mobile device. Bovada offers a few different banking options, including bitcoin, credit cards and direct bank transfers. They have a favorable reputation for paying out quickly and for being reliable with their withdrawals, and we feel completely confident in recommending them because of this. 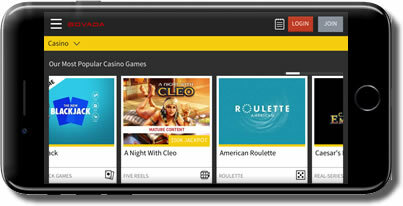 There are a lot of pros to the Bovada Mobile Casino app and very few cons. One con is that they do not have a live chat support option, though for mobile players, that’s rarely optimal anyway. Another con is that they don’t always get the newest titles from Realtime Gaming, though they do from Rival Gaming, because of the nature of their content deal. Other than that, it’s a great place to play for mobile players no matter what kind of device you have, what kind of games you want to play or what level of stakes you’re comfortable with.